Yeh, so this is the final installment in our series acquainting you with some of the riches we recently found over at Mr. Suave's Mod Mod World. Maybe we've overdone it a bit, but once you get there, you'll see we've only scratched the surface. Mr. S plunks our twanger bigtime, and we sure hope he gets to yours as well. We visit his fab blog on a regular basis now and expect to charge our musical loving cup many times in future. We'll say thanks again and look forward to good times ahead. We'll also remind you that once you get to MSMMW, be sure to click the post titles to launch the songs. The Corner Laughers - The Commonest Manifesto - Mr. Suave's Mod Mod World - With their kind permission we posted these San Franciscans early and lovingly. You can hear more here. Behold more of the excellent songage we found at Mr. Suave's Mod Mod World. Links are ready and rarin' and but await your touch. Thanks, Mr. S! The Parties - Gotta Get Out - Mr. Suave's Mod Mod World - We previously posted songs by The Parties here and here, along with songs by other excellent groups. The Young Sportsmen - Metropolitan - Mr. Suave's Mod Mod World - The Young Sportsmen tune I posted is still here, along with songs by some other stellar Seattle bands. Thanks to Mr. Suave's Mod Mod World for posting the following. Click and check 'em out, if you like. The Cute Lepers - It's Summertime Baby - Mr. Suave's Mod Mod World - We posted another by the Leps here. It's still viable, along with a buncha other gooduns. The Pranks - Modern Communication - Mr. Suave's Mod Mod World - We posted this one previously. It isn't working now at our place, but "Spending Time" is, along with some other good songs by some other good artistes. Yeh, we know, you were right, you can't trust pp to ppost anything in a timely manner these days. We therefore, in rapid-fire succession, ppost the rest of the incredible stash of things moderniste we most liked at Mr. Suave's Mod Mod World. We didn't mention last week that Mr. S has been doing a "Mod-A-Day" thing this entire fast-fading last year of the decade, so there are literally hundreds of items you might like even better than the below and those we previously posted. Once you get there, be sure to click on the post title to launch the song. Right-click it to download. And once again: thanks, dear dear Mr. S!!! Trotsky Icepick - Bury Manilow - Mr. Suave's Mod Mod World - A fun, long-time favorite. We also dig "A Little Push at the Top of the Stairs," if you can find it. The Hush Puppies - Hot Shot - Mr. Suave's Mod Mod World - Some mods liked to wear Hush Puppies. Also desert boots!!! I've got a new friend (who, as usual, doesn't actually know me). His name is Mr. Suave, and he's a Mod. 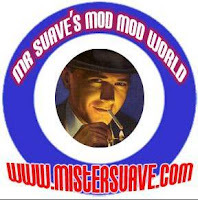 There's a lot more I could tell you about him, but you can easily read and hear all about it at his fantastic blog, Mr. Suave's Mod Mod World. For our immediate purposes, the main thing you need to know is that Mr. S has posted an incredibly large and most excellent buncha songs by mod and mod-influenced artists. Mr. S is not a stickler for genrefication, so his repetoire is deep and wide and includes powerpop, psych, garage, ska, r&b, and other genres. I've found so many ace songs I'm going to spread my favorites out over several posts. ("Uh oh," you say, "when pp says stuff like that, we reach for grains, maybe even pillars of salt, not to mention the fact he hasn't even posted for A FREAKIN' MONTH!") And you are very wise to do so. But, please, be moderate. Give pp a chance. Let's just see what happens, mkay? Lined up below, like so many eager Vespas and Lambrettas, are the pleasure vehicles of Installment 1. Click them to scoot over to MSMMW. I rather think you won't be disappointed. Oh, I should also say that once there, you can either click Mr. S's post titles or the blue mini-players to hear and possibly download the songs. You can often right-click the post title to download the song. Click his blog name at the top to go to his homepage and check out his fun-filled modcasts. Of course, many thanks to The Suave One for turning us on to so much great music. And many thanks as well to the most excellent Peter over at Peter's Power Pop, where I discovered Mr. S in a comment. Julie Ocean - At The Appointed Hour - Mr. Suave's Mod Mod World - I previously posted an excelente by Julie Ocean here. There are other extant excelentes in that post as well. Shoes - Your Very Eyes - Mr. Suave's Mod Mod World - I previously posted a couple of songs by this, one of my all-time favorite bands, here.